Reginald September was born in Wynberg in Cape Town on 13 June 1923, the son of Florence, a housewife, and Nicholas September, a carpenter. He first attended the Broad Road Primary School and then Trafalgar High School in Cape Town where his opposition to white racism was formed by his teachers who encouraged political debate on the inequalities suffered by black people. His political involvement began when he came under the influence of Moses Kotane and James La Guma the two leading communist party leaders in the Western Cape. In 1938, at the age of 15, he joined the National Liberation League led by Cissie Gool and James La Guma and he eventually became a member of its executive committee. A chance lunch time visit to the Hanover Building in District Six resulted in him meeting the regional organiser ofthe South Afrcan Communist Party (SACP), Moses Kotane, whom the 16-year old Reg eventually took home to meet his parents. After completing his matriculation, September worked at a number of odd jobs. He eventually became a full-time trade unionist. He organised textile workers in Port Elizabeth and Cape Town in the 1940s and served a time as shop-steward for the Leather Workers Union. He later worked as an organiser for the National Union of Distributive Workers. When the Government threatened to take the vote away from Coloured people he helped to organise the Franchise Action Council and served as its secretary. 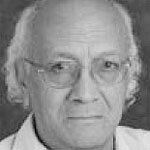 Reginald September went abroad in the early 1950s and on his return in 1953 he became one of the principal founders of the South African Coloured Peoples Organisation (SACPO), which became part of the Congress Alliance. He served as the SACPO’s general secretary from 1954 until 1961, when the government served banning orders to him. He was one of the 156 leaders who were charged in December 1956, in the Treason Trial. He was imprisoned for five months without being charged during the 1960 state of emergency and in 1961 was jailed again for helping to organise the May stay-away, though charges against him were later dropped. In 1963, September was charged for attending a meeting of the Coloured Peoples Congress. In 1963 while on bail, he was ordered by the underground South African Communist Party (SACP) leadership to leave the country and to join the external wing of the organisation. He first went to Tanzania and from there to London. In 1969, at the ANC's Morogoro Conference, a Revolutionary Council (RC) was created to concentrate on the armed struggle. Its responsibility was to integrate political and military strategy for the struggle, with Oliver Tambo as the Chair, Yusuf Dadoo the Vice Chair, Joe Matthews the secretary. Joe Slovo and September were members of the RC. He served as the Chief Representative of the African National Congress (ANC) in London and Western Europe in the 1970s. From Europe he was deployed to Lusaka and served on the ANC’s revolutionary council. At the ANC conference at Kabwe in 1985, September, together with Dr. Dadoo and Joe Slovo were the first non-Africans to be elected on to the ANC’s National Executive Committee (NEC). In exile he also served on the SACP’s political Bureau. 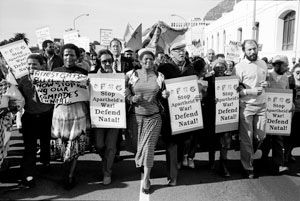 Reginald Reg September, 4th from the right, in a march to protest against the war in Natal, 1990. Photograph by Omar Badsha. In 1991 he came back from exile and as part of the ANC’s NEC he was one of the people involved in the drawing up of the Groote Schuur Minutes. From 1994 until 2004 September served as a Member of Parliament in the new democratic parliament. He was 21-years-old when he married fellow trade-unionist, Hettie McCloud, a stalwart of the liberation struggle who was a leading trade union and SACPO activist. The marriage was short-lived and they divorced almost a year later. The following year he married Sekena Dollie. Sekena was the daughter of Councillor Dollie, a political associate of Dr Abdullah Abduraghman. That marriage ended during the 1960s State of Emergency Treason Trial. In 1974 September married Gwen Miller in the Islington, London where Dr Yusuf Dadoo, the Chairperson of the SACP, was one of the witnesses. They separated In 1988. September then married Melissa Steyn in 1998. September returned from exile in 1991 and participated in the drawing up of the Groote Schuur Minutes and served in the Mandela government as an MP from 1994 until 2004. In 2004, the South African Government conferred the The Order of Luthuli in Silver for his lifetime contribution to the struggle for a non-racial, non-sexist, free and democratic South Africa.